Branimir Rakić is the co-founder and CTO of OriginTrail, the Serbian-Slovenian blockchain company developing the first purpose-built decentralized protocol for supply chains. An MSc in Information Technologies & Electrical Engineering, Branimir has been working on the problems of interoperability of IT systems, interconnecting ERPs, data exchange automation and database management systems. He has pursued blockchain technologies from early on, being specialized in Ethereum blockchain and Solidity language. 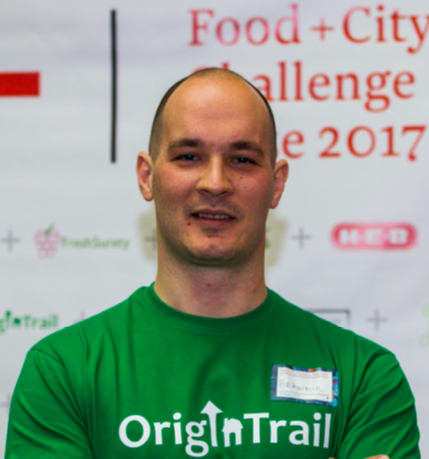 Branimir has led the development of OriginTrail’s pilot projects that already connect global supply chains with the blockchain. OriginTrail successfully finished its token sale in January 2018, collecting USD 22.5 mm value in Ethereum cryptocurrency. OriginTrail is a member of Ethereum Enterprise Alliance and Blockchain for Social Impact Coalition by ConsenSys, and it’s blockchain-based project with Chinese online food marketplace Yimishiji has been admitted to the Innovation Pipeline of Walmart Food Safety Collaboration Center. Trust has two enemies — bad character and bad data. Decentralization and blockchain are a logical remedy to reconcile the trust gap in today’s supply chains which are growing in complexity and size. OriginTrail is a decentralized peer-to-peer network built on top of blockchain, made to address supply chain challenges in a scalable way.